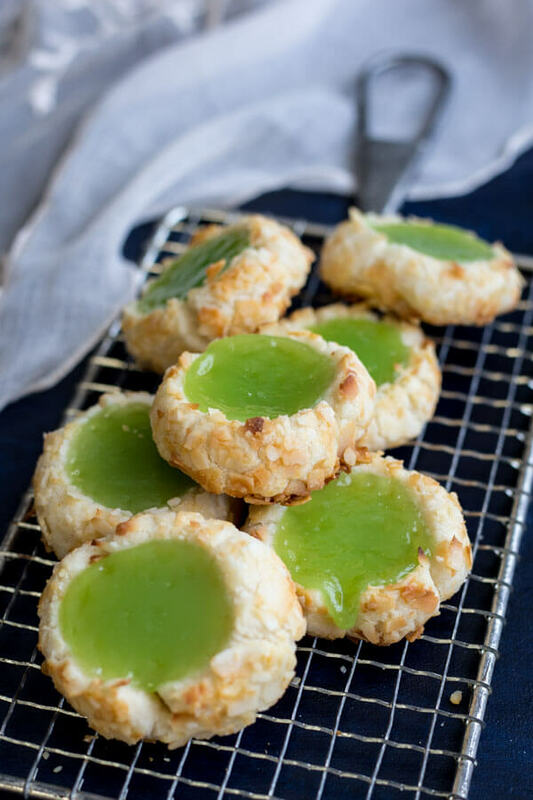 These Pandan Coconut Thumbprint Cookies are made with a shortbread cookie base, covered in coconut flakes and filled with a creamy pandan coconut curd. The tropical flavors add a wonderful twist in this classic thumbprint cookie recipe. 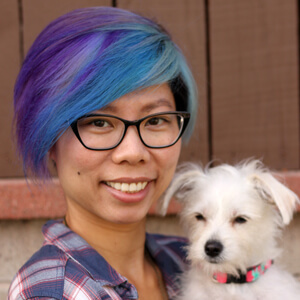 Sometimes, I think about where I live, Southern California, and I’m thankful for its diversity and especially the large Asian community here. Growing up on purely Asian food, I will not be able to survive if I’m not fed at least one Asian meal per week. 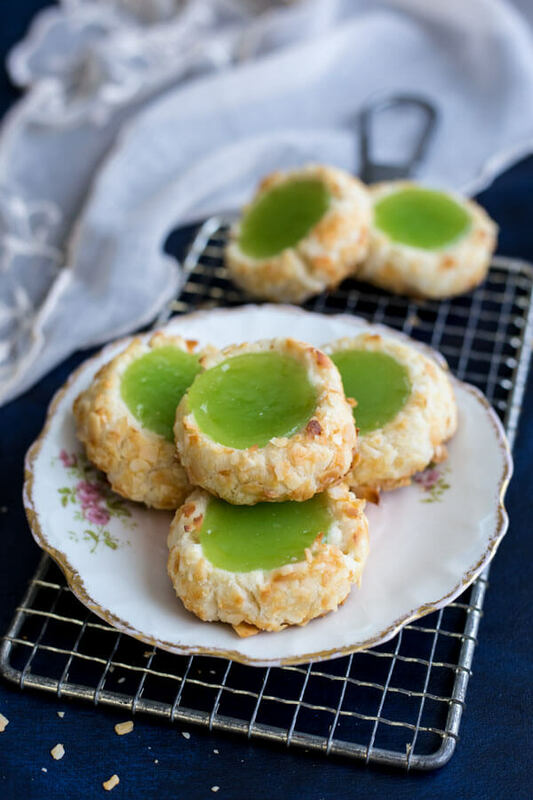 My husband and I frequent a Malaysian restaurant, where I found jars of pandan coconut curd, which I immediately brought home to turn into these Pandan Coconut Thumbprint Cookies. Pandan, also known as screwpine leaf, is a herbaceous tropical plant grown in Southeast Asia. Its leaves are used extensively in Asian cooking. It is a common flavoring as compared to vanilla in the West and has been referred to as the vanilla of Southeast Asia. It has a distinct floral and slightly grassy frangrance, and pairs perfectly with coconut. These tropical inspired thumbprint cookies are made with a smaller batch of my classic shortbread cookie dough. This batch will make one perfect dozen of little dough balls. Each balls will be approximately 1 to 1 1/8 oz. A kitchen scale is very useful in helping you portion the dough for this recipe. 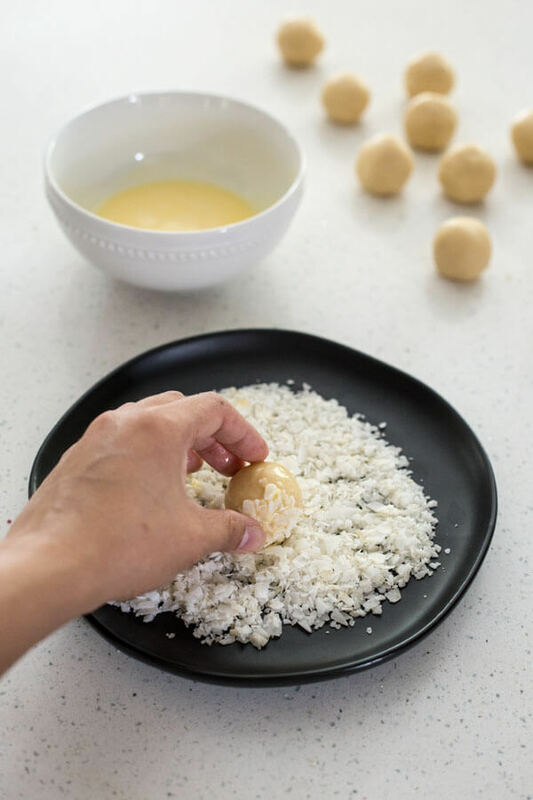 An egg wash, made from whole egg and cream or milk, is used to coat the dough before rolling it in coconut flakes to help the coconut flakes adhere to the dough. I always use unsweetened coconut to keep the cookies from being overly sweet. You can opt to use shredded coconut if that’s what you have on hand, as well as sweetened coconut if you like your cookies a little on the sweeter side. Then place your coconut covered dough balls on a parchment lined baking sheet. The whole batch fits on my largest baking sheet. 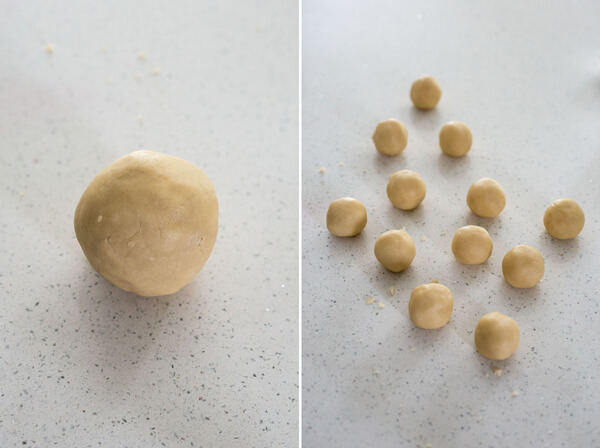 To create indentations for the “thumbprints” use the back of a teaspoon and press down on the dough balls. You will flatten it while creating uniform indentations. 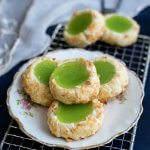 Fill each “thumbprint” with a teaspoon of the pandan coconut curd, and bake until light golden brown. 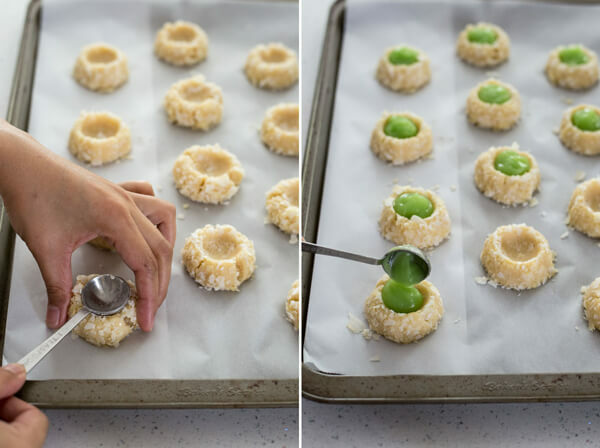 As these Pandan Coconut Thumbprint Cookies bake in the oven, the curd will thicken and become more jammy. These thumbprint cookies have a very light floral aroma, not too grassy, and definitely more coconut-y. If you have an Asian grocery store near you, you should be able to find this pandan coconut curd. 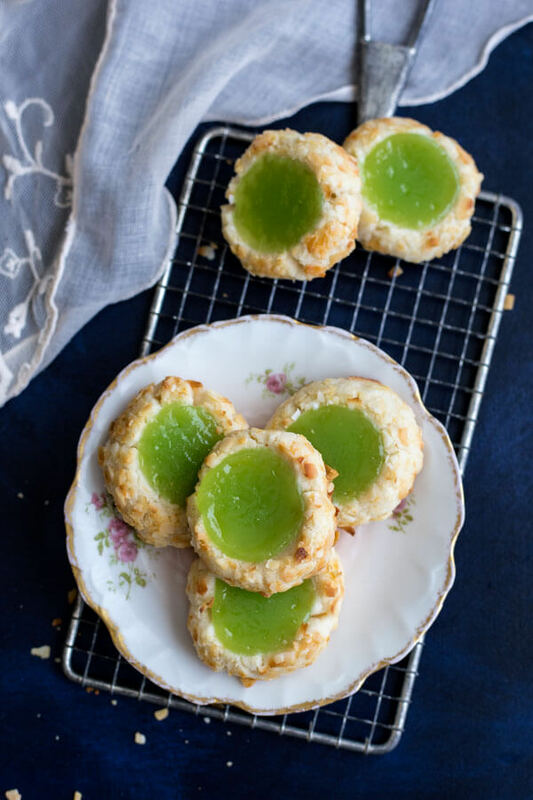 Otherwise, you can always make these Coconut Guava Thumbprint Cookies while you browse for pandan coconut curd online. Beat softened butter with sugar in the stand mixer bowl with the paddle attachment until fluffy. Add vanilla and continue to beat until combined. Add flour and salt in a small mixing bowl, and mix with a whisk to distribute evenly. With the mixer on low speed, add the flour mixture to the butter and mix until the dough comes together. Dump the dough out onto a lightly flour board and shape into a ball. Beat an egg with a tablespoon of cream or milk in a small bowl to make egg wash. Spread coconut flakes onto a flat plate and set aside. Divide the dough into 12 portions, about 1 - 1 1/8 oz each. 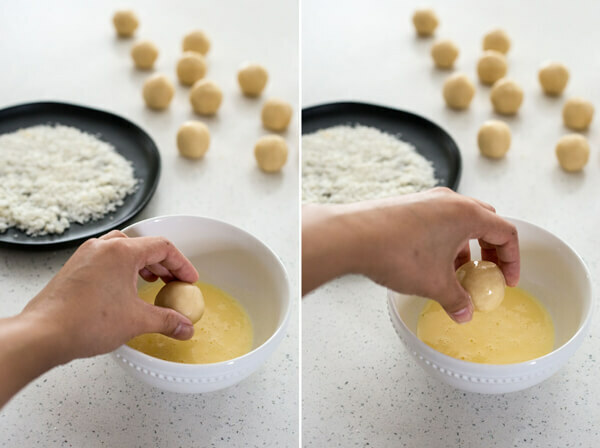 Roll each portion into a ball between your palms. Dip dough balls in egg wash and then roll in coconut flake. Place on parchment line baking sheets about 2” apart. 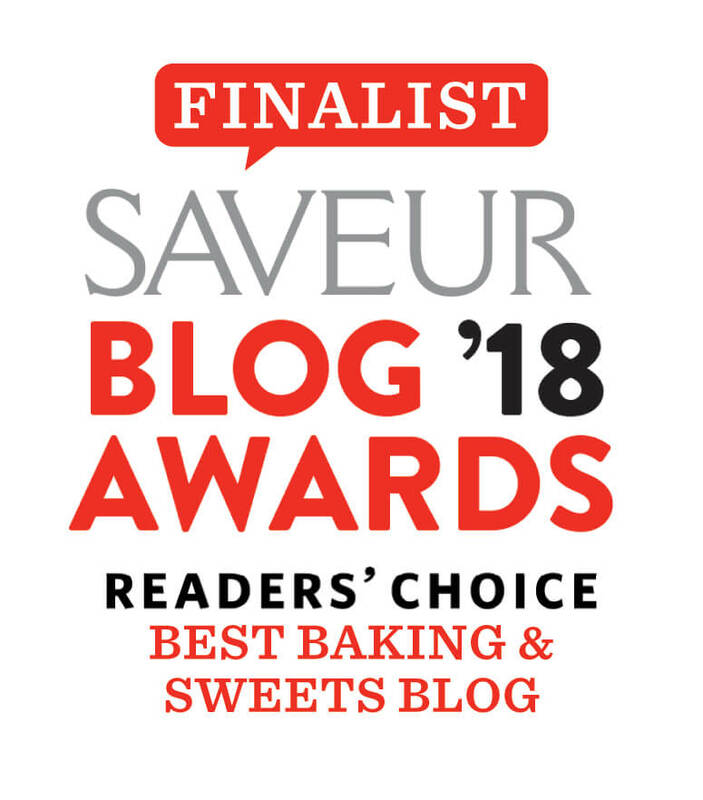 Press down on each dough ball using the back of a teaspoon to make indentation, dip the teaspoon in flour each time to prevent dough from sticking. Fill each indentation with 1 teaspoon of pandan coconut curd. Refrigerate while you preheat the oven to 350°F. Bake cookies for 22 minutes. Remove from the oven and let cookies cool on the baking sheet for 5 - 10 minutes before transferring to a wire rack to cool completely. You can use shredded coconut in place of coconut flake. If you have coconut chip, you can shred it in a food processor to make coconut flake. If you like your cookies on the sweeter side you can opt for sweetened coconut. These look so beautiful – I love that colour. I’ve used pandan leaves in savoury cooking but never knew it could be turned into something as lovely as this.